The 2nd major of the PGA Tour Season, the US Open (United States Open Championship), is usually the most unpredictable of the 4 majors for fantasy golf players and for bettors. The U.S. Open changes golf courses each year, and has historically been set up to be a tough course to reach par at. If you enter the Biggest Fantasy Golf Contest online, you will need to do your research, as course history is usually NOT a good fantasy golf strategy to look at for the US Open. The 2018 U.S. Open is being played at Shinnecock Hills which has hosted the US Open 4 times previously. It last hosted the US Open in 2004 but since then the course has had some major renos done to it and it is now almost 500 yards longer. Still a par 70 the course is at 7446 yards which will mean players will have to be long and straight to avoid the punishing rough of the U.S. Open setup. 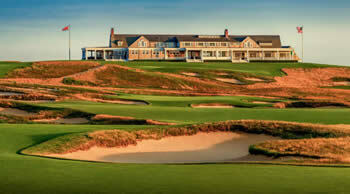 For fantasy golf players expect to have lots of great choices as the best of the best will tee it up at Shinnecock. Obviously the favorites like Jordan Spieth and Dustin Johnson will be in everyone's lineups but you'll need to find some US Open Sleeper Picks to help you make a winning lineup. Check out our Sleepers page to help you find sleeper picks for the US Open and to check out a couple of guys that we suggest you put into some of your fantasy golf lineups. Where is the 2018 U.S. Open being played? We have done a comparison of all the Top Fantasy Golf Sites and we have found that DraftKings is running the BIGGEST Fantasy Golf Contest for the 2018 US Open. FanDuel is running a big fantasy golf contest for the US Open too so you may want to check them both out and decide which one you have the best chance of winning. For just a small entry fee, you could win a gigantic cash prize just for picking fantasy golfers. In terms of fantasy golf, sites like Yahoo Fantasy Golf, PGA Tour fantasy games or the Golf Channel can't offer you the cash prizes that this one does. One of the top websites that offers US Open Expert Golf Picks is GolfStats.com. They offer up expert analysis of the players, the course and the stats and put it all into their DraftKings picks to win or you can use them like we do and pick some of the betting favorites to win. The current US Open Betting odds are up and the earlier you read this, the better the odds are for you to take advantage. For Betting on Golf – Take the list of players they provide and wager the same amount on each golfer. If one of them wins, you win money! For Fantasy Golf – Take the provided list of golfers and enter a salary cap lineup with as many of the picks as possible. Even if none of them win, if they all have great tournaments, you will still win money in a fantasy golf game. GolfStats offers their DraftKings Fantasy Golf Picks as well so it's now easier to set a solid lineup with their plays. Lots of sites offer you their FREE Expert Picks…but someone who has a blog on the side of his day job and watches golf on the weekends IS NOT AN EXPERT! If you truly are looking for picks that will help you win cash, you need to invest a little to get a lot! The US Open is a huge golf tournament and with the tough set up of the course, you need someone with good knowledge to help you with picks…not just someone that thinks they know about golf and has a blog about it.